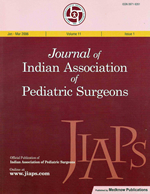 Aim: To know whether laboratory or clinical parameters can predict disease progression, need for laparotomy in patients managed with peritoneal drain and mortality in surgical neonatal necrotizing enterocolitis patients. Materials and Methods: The study was retrospectively carried out on 27 neonates over a period of one and a half year. All neonates who had surgical neonatal necrotizing enterocolitis in the form of bowel perforation, positive paracentesis, abdominal wall erythema and abdominal lump were included. Patients with Bell′s stage I and those developing enterocolitis after surgery were excluded. The patients were evaluated with parameters, namely, clinical, laboratory and radiological. These included age and stage at presentation, primary symptom/sign at presentation with laboratory parameters of blood counts, pH, base deficit, platelet counts, electrolytes and random blood sugar levels. A comparison was done between survivors and nonsurvivors, patients with primary peritoneal drainage versus those requiring laparotomy after drain, Bell′ stage II versus III patients and operated versus nonoperated patients. Statistical significance was observed in the above mentioned comparisons. Results: There were 22 male and 5 females patients with mean birth weight of 1.85 kg. Age at presentation ranged from 2 to 19 days, mean 9.25 days. Mortality was 37% (10/27). Majority of the stage II patients presented with feed intolerance and abdominal distension. The neonates with severe disease had abdominal distension with wall erythema. Sixty percent of the patients had shock at the time of admission. In the comparison of peritoneal drain only and patients with peritoneal drain followed by laparotomy patients, it was observed that neonates who were acidotic and had higher base deficit had more chances of requirement of laparotomy. They also had progressive fall in platelets counts. There was no difference in the birth weight, gestational age, total counts, serum electrolytes, blood sugar and other measured parameters; thus, these carry negligible predictive value to judge deteriorating neonate. In the remaining of the comparison, patients not presenting with shock were more likely to survive. Conclusion: In the present study, neonate with persistently low pH, higher base deficit and presentation with shock predicted need for laparotomy in drain managed patients as well as chances of survival.